> Ascentis > How to select benefits management software that will meet your company's current and future needs. Most executives agree that they would greatly benefit from their HR professionals having the opportunity to focus more of their energies on strategic issues. It is no secret that the top-performing companies in the S&P 500 have the strongest focus on employee development. But in reality, the majority of an HR department’s time and resources are taken up with day-to-day tactical issues— up to five hours per day, some studies suggest. 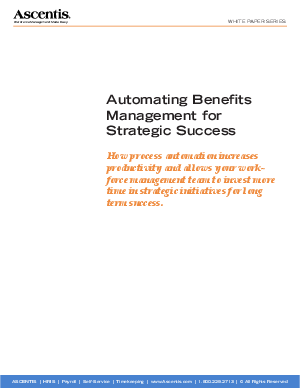 For larger companies, the technology to automate HR and benefits issues has been available for some time, and is widely used. However the resources and infrastructure required to install and maintain a large and complex system has made the cost of entry prohibitive, both financially and technologically, for companies in the mid-tier. Today, software solutions are emerging that can provide a practical answer to mid-sized organizations. The problem then becomes how to choose the one that is the best fit for their requirements while also being affordable, flexible and agile enough to cope with constant change, whether it comes from within the organization or from legislation such as HIPAA and the E-sign Act. This paper discusses what to look for in an HRIS solution that will work optimally for the mid-sized organization.